What does IAPAM Certification Mean? The IAPAM (International Association for Physicians in Aesthetic Medicine) was founded in 2006 to teach physicians the best practices when adding aesthetic and/or medically supervised weight loss procedures to their traditional medical practices. We have been providing hands-on, CME aesthetic medicine and medically supervised weight loss training programs. To date, over 5,000 physicians have attended our training programs. Our hands-on live training programs are CME (Continuing Medical Education) approved by the ACCME. Our programs last between 8-25 hours, and physicians and licensed healthcare providers can earn up to 32.5 AMA CME credits. CME credits help physicians and other licensed healthcare providers obtain accredited continuing medical education to help them improve their practice and deliver high-quality, safe, effective patient care. We also offer additional education in the best practices of operating a medical practice. “A branch of medicine focused on satisfying the aesthetic desires and goals of patients. This specialty is primarily focused on the pathophysiology of aging skin, and adheres to scientific based procedures. Our Members are dedicated to providing medically competent service with compassion and respect for human dignity; our Members understand the physician-patient relationship is based on confidentiality, trust, and honesty; and our Members maintain a reputation for truth and honesty. In all professional conduct, IAPAM members are expected to provide competent and compassionate patient care, exercise appropriate respect for other health care professionals, other members and maintain the patient’s best interests; our Members follow the rules and regulations of their regulatory body, and maintain an active medical license. Success is only achieved when we create a win-win. Trust & Integrity are choices we make, and are a vital ingredient for a long term relationship. 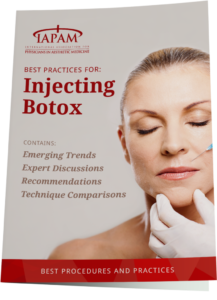 If you’ve been paying attention to the latest trends in beauty and skin care, you already understand that in order to provide the best aesthetic medicine options to your patients Botox® training is absolutely essential part of any aesthetic practice. In fact, there is no single product or “anti-aging” cream or home remedy that will eliminate wrinkles, crow’s feet, deep lines, or defy the aging process as quickly as Botox®. Now in its 10th year providing Hands-on, CME Botox Training to physicians and other licensed healthcare providers, the IAPAM’s industry-leading Botox® Training course is the fastest way for you to incorporate aesthetics into an existing medical practice or stand alone medical spa. If you have not already – Get Started Now with the #1 Aesthetic Procedure: Botox!